When you want to add a little fun and style to your wedding, AF1 has the perfect ideas! 15% Discount if more than one item hired! 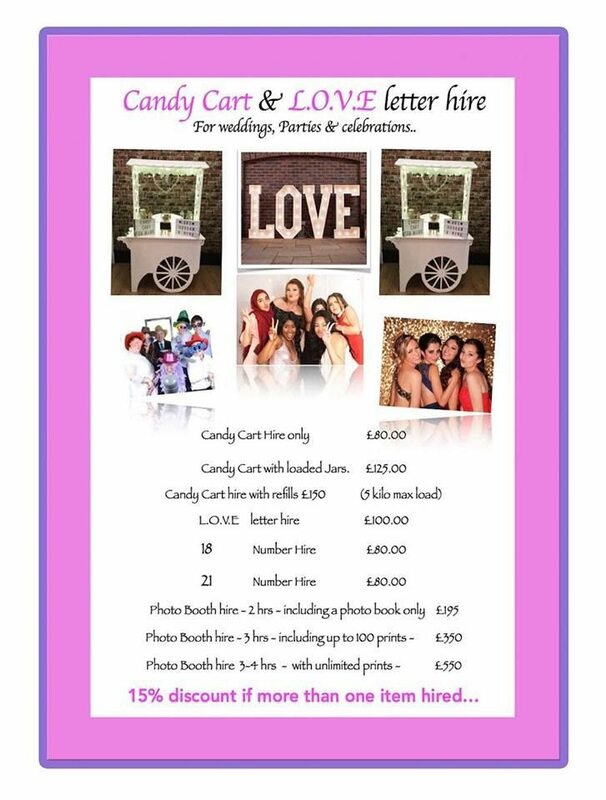 AF1’s gorgeous, handcrafted, Candy Cart Hire Service in Derby offers you and your guests a stylish alternative to traditional wedding features or the ubiquitous chocolate fountains. Having a sweet cart at your wedding will certainly impress your guests, add a lovely feature in your wedding room to make the wedding more memorable for you and your guests. Our Candy Cart is available to hire for any special occasion including weddings, parties, celebrations and corporate events in Derby and The Midlands. Hiring LOVE Letters will be the finishing touch for your weddings or engagement and is the latest trend. Our large, lit large Love Letters really stand out and add a touch of shimmer and style to the wedding room. ​The Love Letters look fabulous placed behind the Top Table at your wedding breakfast, next to the wedding cake, shining over the dance floor, or at the entrance. Perfect for posing with for your wedding photos.